Looking for some inspiration for your Thanksgiving Dinner? I’ve got you covered with everything from Gluten Free Appetizers, Desserts and everything in between. 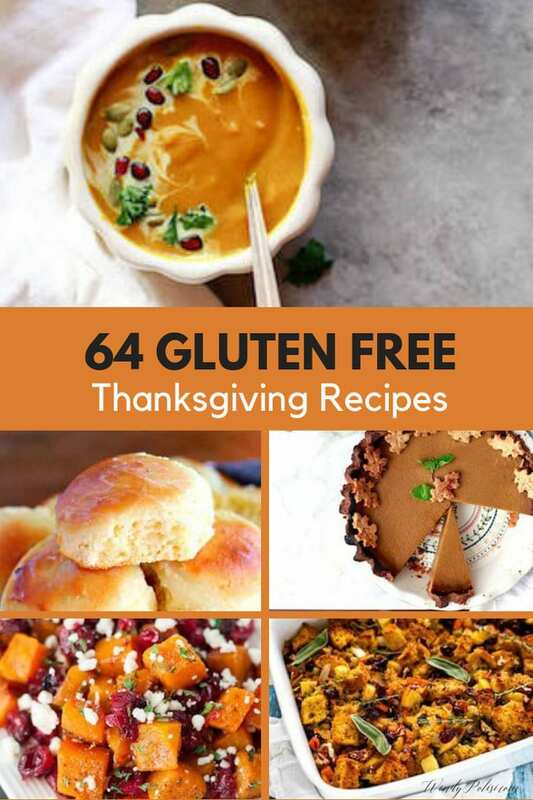 Check out these 64 Gluten Free Thanksgiving Recipes. Although planning for the holidays with three kids can be overwhelming, I never fail to enjoy planning the food. Truth be told, I may enjoy looking at recipes, creating new ones and planning to make them even more than I enjoy cooking. Now that I’m gluten-free (and the rest of the family isn’t) it takes even more time to plan and prepare. Not that I’m complaining. 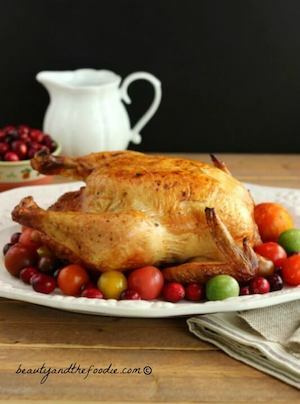 For those of you who don’t share my love for searching for recipes, here are some great Gluten Free Thanksgiving Recipes to consider putting on your menu this year. 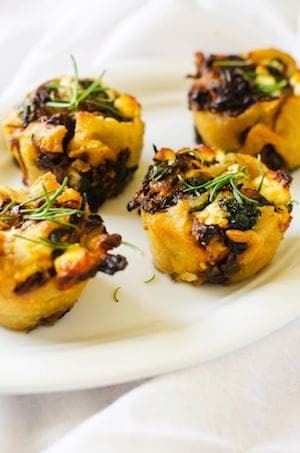 This fancy and crazy-delicious appetizer takes just 15 minutes to make. 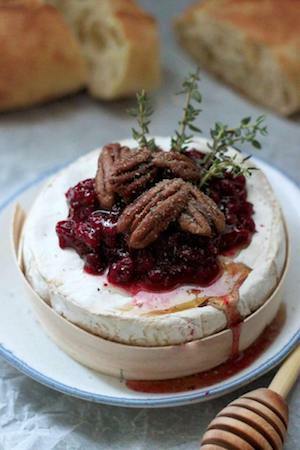 I am not sure it gets any better than baked brie topped with cranberry sauce, roasted pecans and thyme. 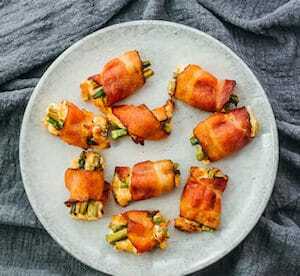 This deliciously simple appetizer is perfect for cocktail hour. No knife and fork needed. 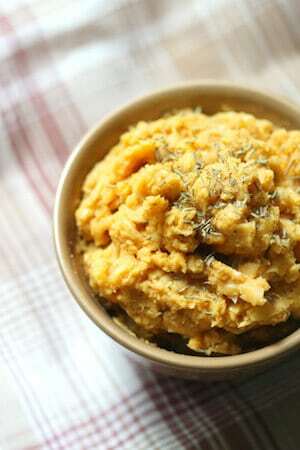 This Savory Pumpkin Hummus is the perfect appetizer to set out as guests start to arrive! 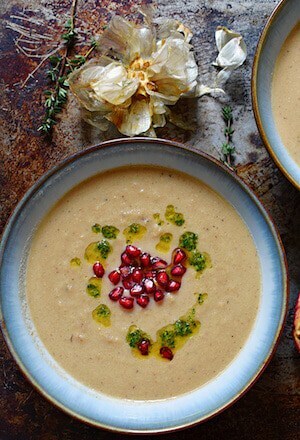 This vegan and gluten-free soup freezes well and makes the perfect holiday starter! 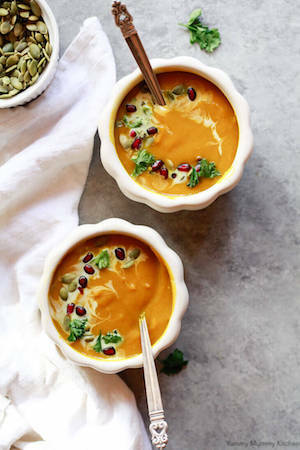 This deliciously healthy soup is easy enough for a weeknight but delicious enough for your holiday table. Curried Butternut Squash Pumpkin Soup from Yummy Mummy Kitchen. 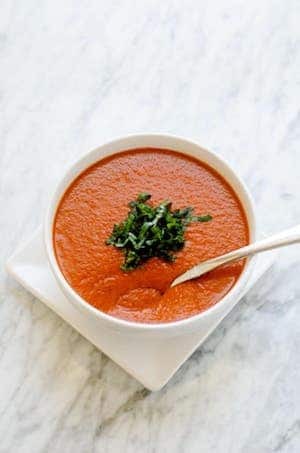 This soup is creamy and nourishing! With ginger, curry powder, and turmeric, this beautiful autumn soup is the perfect way to start your holiday meal. 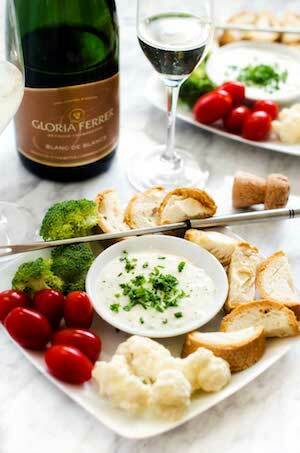 Throw back to the 70s with this deliciously indulgent fondue! It is a fun way to start your holiday party. 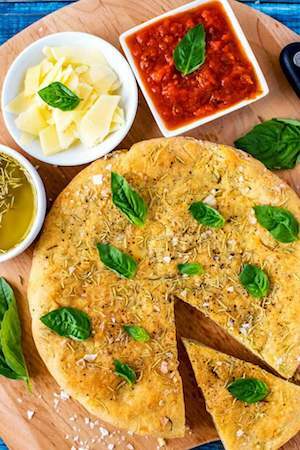 This delicious Rosemary Focaccia is so good, that no one will guess it is gluten-free. Even my picky kids loved it. 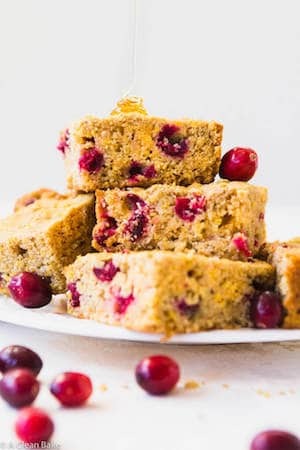 This delicious cornbread recipe gets a fresh burst of color and flavor with the addition of cranberries. 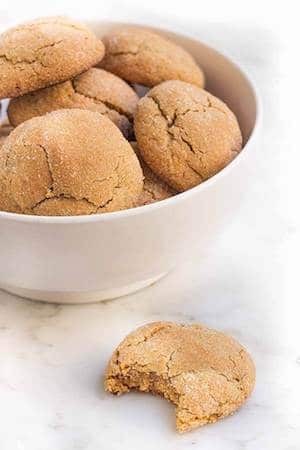 It is tender, slightly chewy and lightly sweetened with unrefined sweeteners. Watching your carbs doesn’t mean you have to give up your bread this Thanksgiving with these buttery, cheesy pull apart rolls. 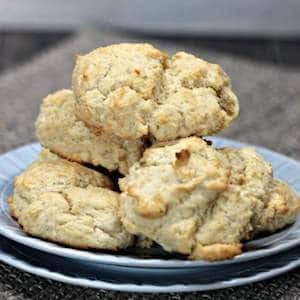 Want a gluten free biscuit that is so good that even the non-gluten free crowd will love them? This recipe has you covered. 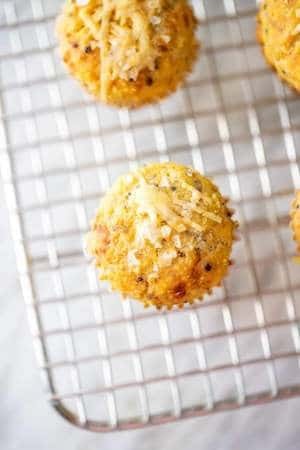 These Gluten Free Corn Muffins have a secret ingredient in them that gives them an extra punch of flavor. Can you guess what it is? 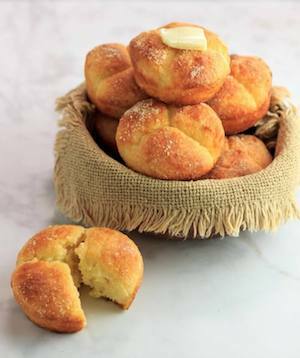 There is no sacrifice with these soft and tasty dinner rolls! They even have a dairy-free option. You are going to love these delicious little rolls. They work just as well as an appetizer as they do as a side dish. 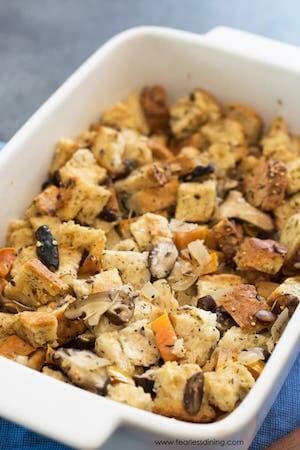 This Gluten Free Stuffing recipe is the perfect stuffing for Thanksgiving or Christmas! Best of all, no one will mind that this homemade stuffing is gluten-free. It tastes just like the “real thing”! 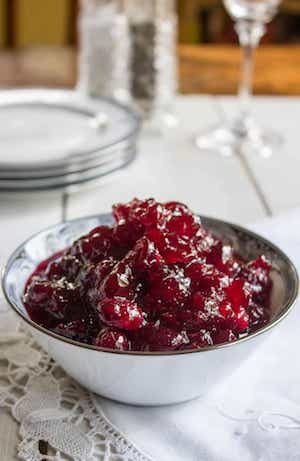 Everyone knows that cranberry sauce made from scratch is better than what you get in a can! This recipe shows you how to make it happen. 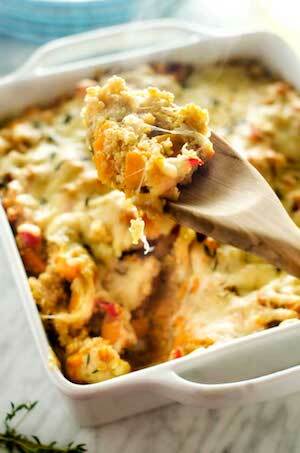 This delicious and easy to make casserole makes the perfect side dish or vegetarian main course. 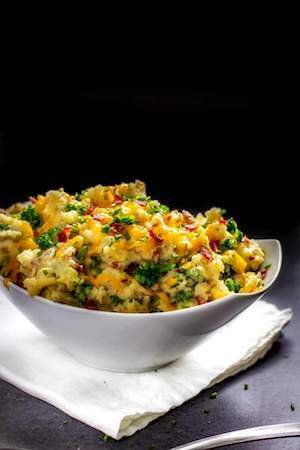 This delicious comfort food dish is a great way to sneak in some veggies on your little ones. You can even make it ahead as a casserole. 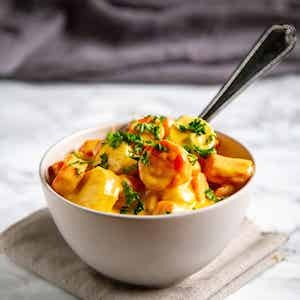 This creamy Cheesy Instant Pot Steamed Carrots and Parnsips prove that gluten-free sides don’t have to mean sacrifice! This maple glazed squash recipe has just five ingredients and is the perfect addition to your holiday table. 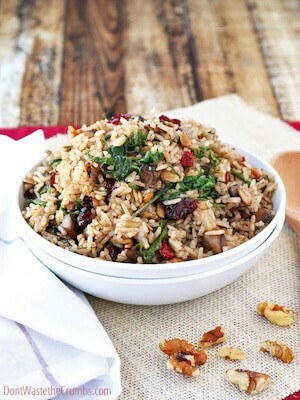 There is so much goodness packed into this delicious Harvest Wild Rice Salad. 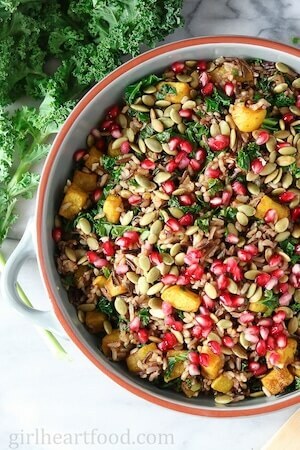 It is a delightful combo of a wild rice blend, sauteed kale, and roasted acorn squash. 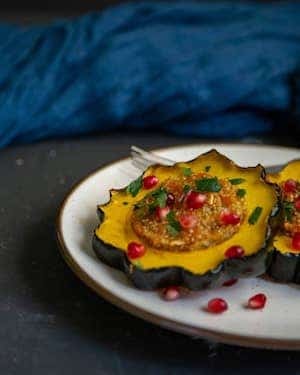 Add the pomegranate and pumpkin seed garnish, and you’ve got a beautiful dish that is long on both texture and flavor. 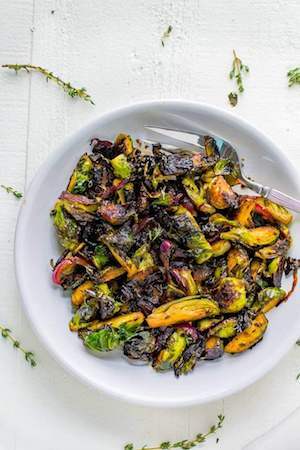 These Crispy Brussels Sprouts are all about the texture. This healthy side is sure to go fast. This simple dish is sure to be a hit on your holiday table. 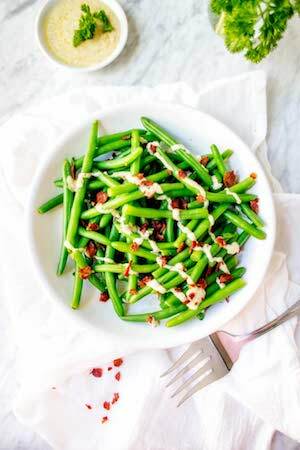 Crispy green beans are topped with a delicious tahini sauce and garnished with bacon. 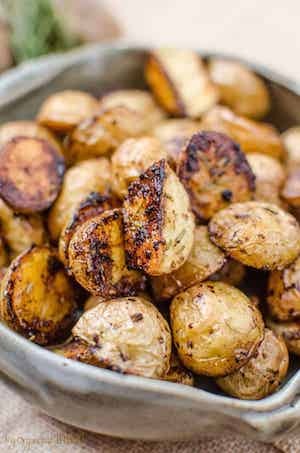 These perfectly seasoned Crispy Rosemary Balsamic Potatoes are the perfect blend of sweet and savory. 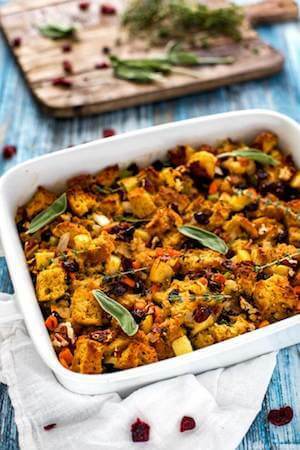 This breadless “stuffing” makes the perfect easy side dish! This nutritious salad makes a beautiful addition to your holiday table. 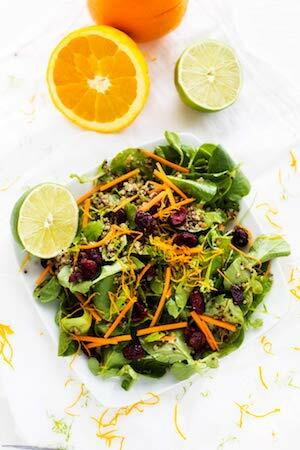 This beautiful salad with orange, mint, and kale makes the perfect healthy side dish! 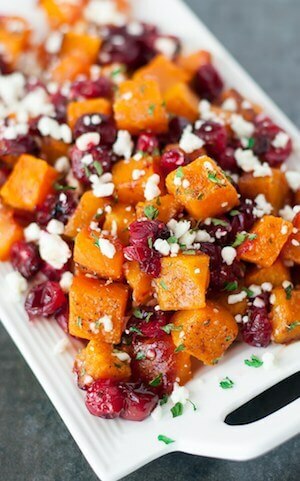 This sweet and savory side dish is packed with the best flavors of fall! With pecorino and pancetta, this simple side dish is anything but bland! This salad adds a beautiful pop of color to your holiday table. I’ve been known to eat leftovers of this cold for breakfast! 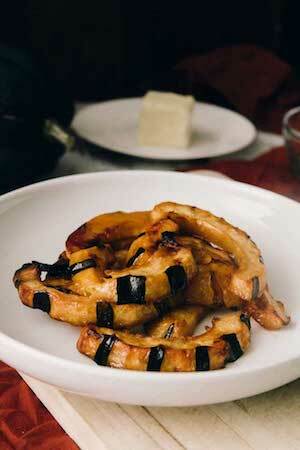 These Roasted Acorn Squash Rings make a great side or even a vegetarian main course. 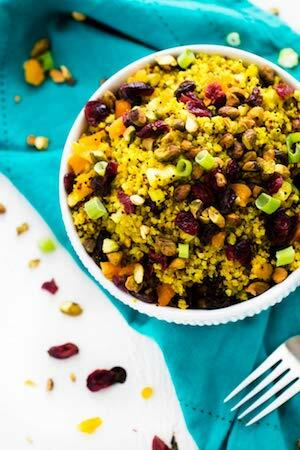 With quinoa, dried apricots, pomegranates, almonds, mustard, and maple syrup, you’ve got a healthy protein and flavor-packed dish! I’m not sure what I like most about this Simple Autumn Rice Pilaf. Is it the smell of the cinnamon or the tang of cranberry? Maybe it is the two combined, plus the added texture from the sunflower seeds. Either way, this is one you will make time and again. 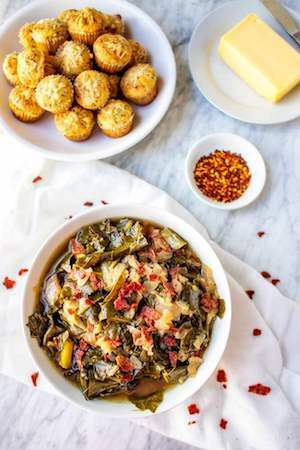 Get your slow cooker in on the action this Thanksgiving with this Slow Cooker Collard Green Recipe. This is a traditional southern side dish that you don’t want to miss. 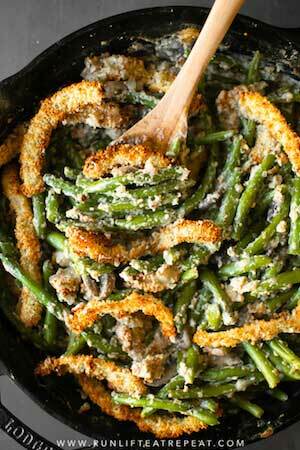 A green bean casserole that is healthier and made from scratch? Yes, please! 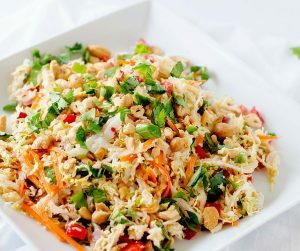 This is one side dish that your guests are sure to rave about. This is a throwback from deep in the archives and the photos are terrible, but his Sweet Potato Casserole is delicious! This simple Gluten-Free Mushroom Stuffing is a great recipe to make ahead of time! 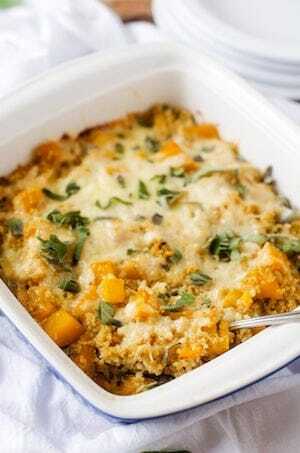 Like my Butternut Squash Quinoa Casserole, this Sweet Potato version makes a perfect vegetarian main course. These crispy crunchy Brussels Sprouts are perfect for your holiday table, but you are going to want to make them year around! Is it an appetizer or side dish? You can decide that, but what I do know is that this delicious dish is sure to be a hit. 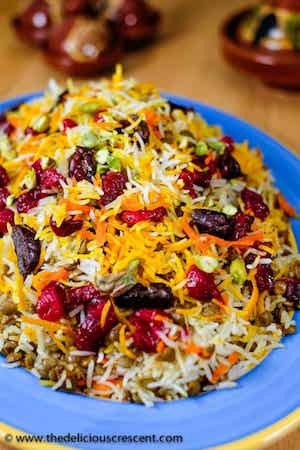 This Persian style dish pairs lentils, rice and cranberries. It is tangy, with the perfect blend of sweet and savory. These potato pancakes work just as well for breakfast as they do for a holiday side. I love them served with gravy. 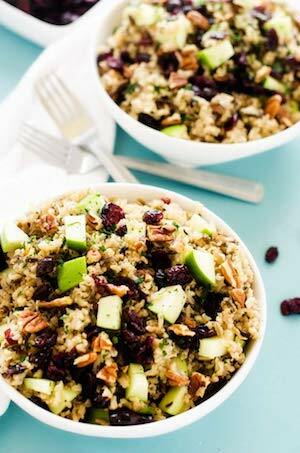 This wild rice pilaf is a simple side dish that is packed with fall flavors. If you are looking for a healthy vegetarian dish that works as a side or main course, it doesn’t get much better than this Creamy Pumpkin Millet and Quinoa! Who else loves it when delicious and easy collide? 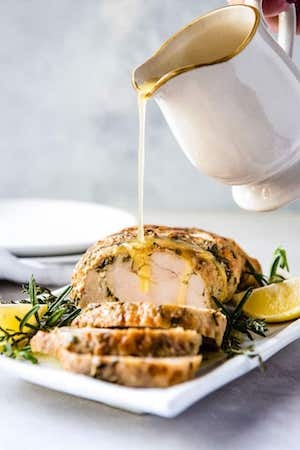 Skip the stress this holiday season with this Instant Pot Turkey Breast with Garlic Butter Gravy. You can make moist and juicy turkey and gravy in less than an hour. This is one of those recipes that works just as well for Thanksgiving dinner as it does Tuesday night. 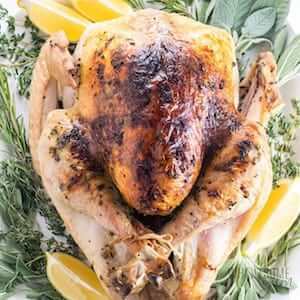 Check out this easy method for roasting a chicken (or turkey) that produces perfect results every time! If you are planning on roasting a whole turkey, don’t miss this comprehensive guide from Wholesome Yum. If you are vegan or have vegans that you will be sharing Thanksgiving with, you won’t want to miss this Mushroom-Walnut Meatless Love. 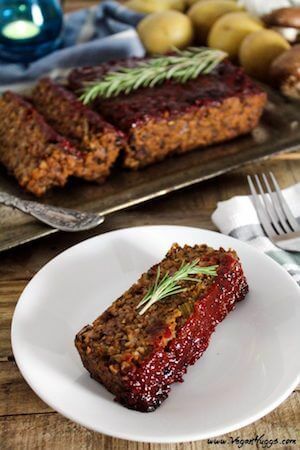 With a delicious ketchup glaze, this is one healthy dish that is hearty and full of flavor. 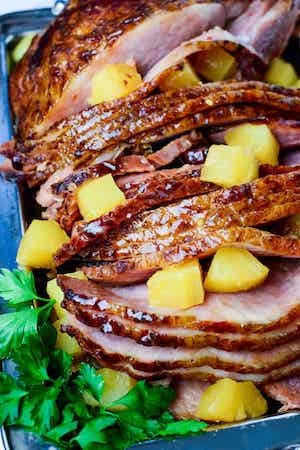 Keep it simple this Thanksgiving with this Slow Cooker Brown Sugar Pineapple Ham. You won’t believe how delicious a recipe with just 5 ingredients can be. Save that oven space and put your grill to work with this easy Grilled Turkey Recipe! The fastest way to get turkey on the table? Use your Instant Pot. 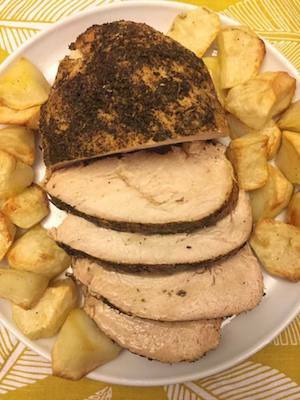 This Instant Pot Turkey Breast recipe is quick and easy and will give you the moistest roast turkey breast ever. 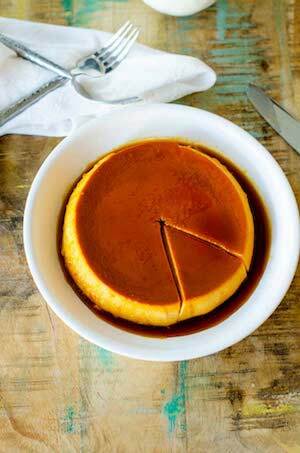 This Pumpkin Flan is a delicious twist on a classic. The perfect way to mix things up on your Thanksgiving dessert table. 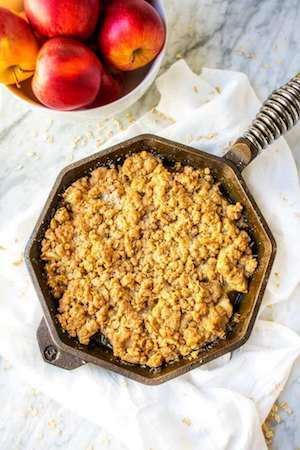 This delicious apple crisp is a healthier dessert option! 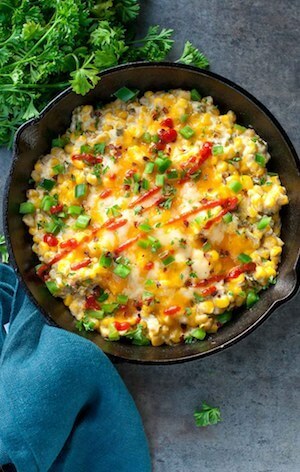 Make it in a cast iron skillet for easy clean up. You may want to make a double batch because these soft and chewy cookies are sure to go fast! 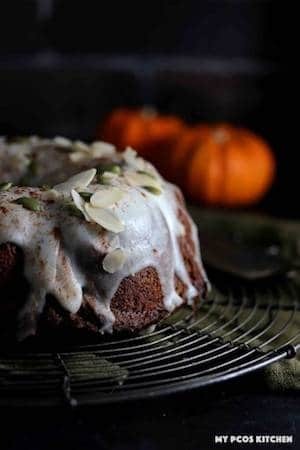 This Pumpkin Bundt Cake is both Paleo and Keto Friendly making it the perfect healthier dessert option for your Thanksgiving table. 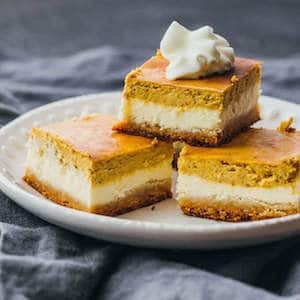 These delicious pumpkin cheesecake bars have an almond flour crust, a middle layer of cheesecake and a delicious pumpkin layer on the top. Perfection! Dates and maple syrup come together to make a delicious filling for these vegan and paleo pumpkin pie bars. 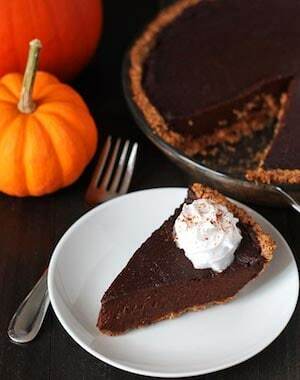 Mix things up for dessert this holiday season with this Chocolate Pumpkin Pie. It is gluten-free and vegan and packed with chocolate and pumpkin flavors. 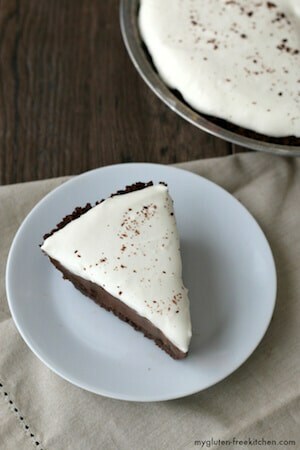 This Gluten-Free Chocolate Pie has a delicious chocolate cookie crust and is rich and creamy. You may want to hide a piece in the fridge under the kale because this is one that is going to disappear quickly! 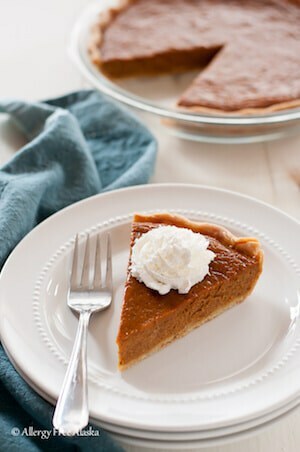 Looking for a delicious gluten free Thanksgiving pie crust? 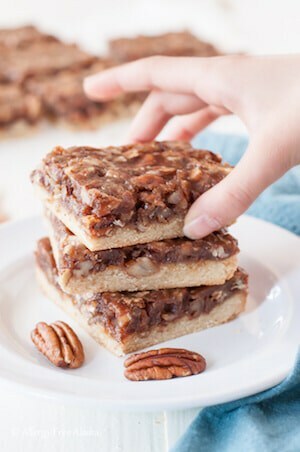 This easy recipe shows you how to make one with gluten-free flour, pecans, and brown sugar. The perfect pie for Thanksgiving. 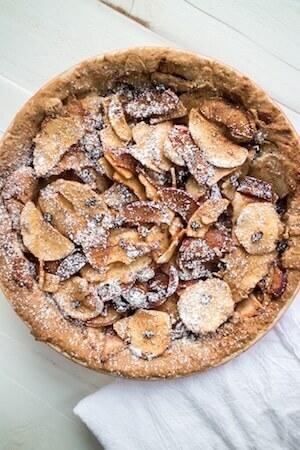 Not only is this delicious pie gluten and dairy free – it is also refined sugar free. The only thing NOT missing? The taste! 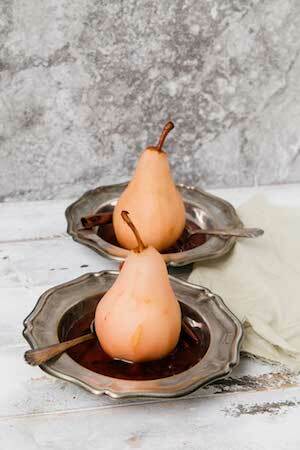 These Cranberry Poached Pears make an elegantly delicious finish to your holiday meal. 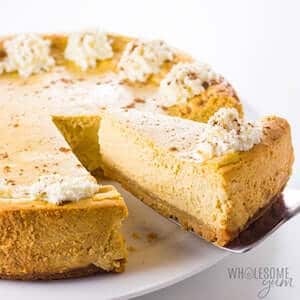 With an almond flour crust and coconut milk filling, this vegan pumpkin pie is one that everyone in the crowd can enjoy! 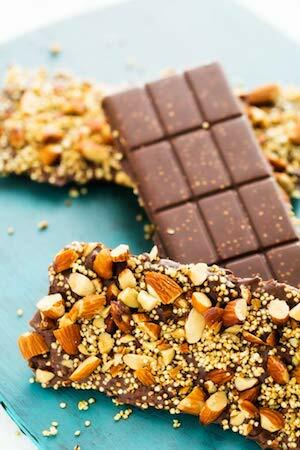 Kids and adults alike love these crunchy chocolate bars. Nothing wrong with sneaking a little nutrition into your dessert! 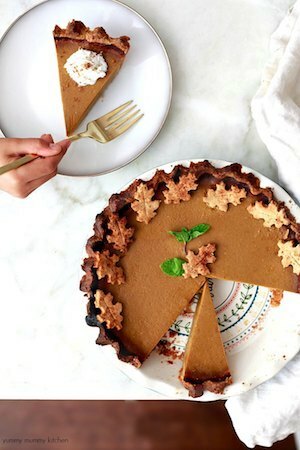 What are your favorite Gluten Free Thanksgiving Recipes? 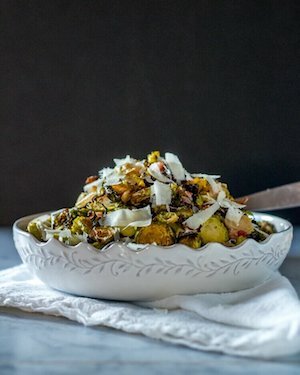 I love including a couple gluten free holiday sides in my Thanksgiving spread and this post is perfect for inspiration! Thanks so much for including me! Thank you so much for this recipe round up. My niece has been put on a gluten free diet recently and my sister is scrambling for recipes for food her daughter might like. I think with these recipes, my niece won’t be upset anymore. That’s quite a compilation! 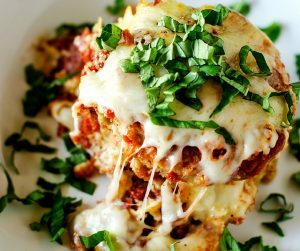 We aren’t a gluten free family, but I have been looking to cut back and see a couple of recipes here that look like they need an add to our menu! wow this sounds so so great. Love these recipe ideas. Such a delicious selection of recipes. My husband is gluten free so I’ll certainly be giving some of these a try. Thank you for including my recipe! Goat Cheese Gruyere Fondue is my favorite, My friend and I often make these when we get together for the afternoon, and we enjoyed it with wine so much! I will make some for my family again for this Christmas. 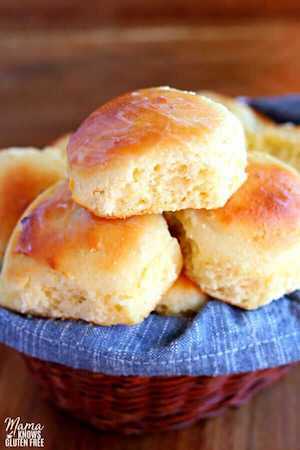 These gluten free rolls looks so delicious! I really love all these options for my gluten free daughter! What I would have done for this amazing list when my daughter thought she had Celiac. That was a rough Thanksgiving. There is something on this list that is sure to fit everyone’s taste. What a great list for Thanksgiving to help those eating gluten free have a delicious meal as well. I love that so many of these are not complicated and time consuming. I realize Thanksgiving is all about the awesome cooking, but I will take any time savers I can get. What a great variety of gluten free foods. The recipes all turned out so delicious looking. I love that some of them are easy and quick.